Winter is once again just around the corner, and in some areas, thermometers and forecasts already have runners eyeing their treadmills and trying to figure out how to stomach a winter of indoor running. But the hardy and hale runners among us, undaunted by a little snow and some brisk temperatures, are breaking out the winter running gear and figuring out how to keep some feeling in the finger tips throughout their long run. So if you are planning on lowering your pace this winter while the temperature is lowering the mercury, you’ll need a good pair of running gloves. Keeping your vulnerable extremities warm without adding much weight to your running gear can make a cold winter run seem, dare we say it, almost enjoyable! Any pair of gloves will do, right? Not exactly. Running gloves are different from normal gloves because they wick moisture away from your skin while preventing any other moisture from soaking your palms. 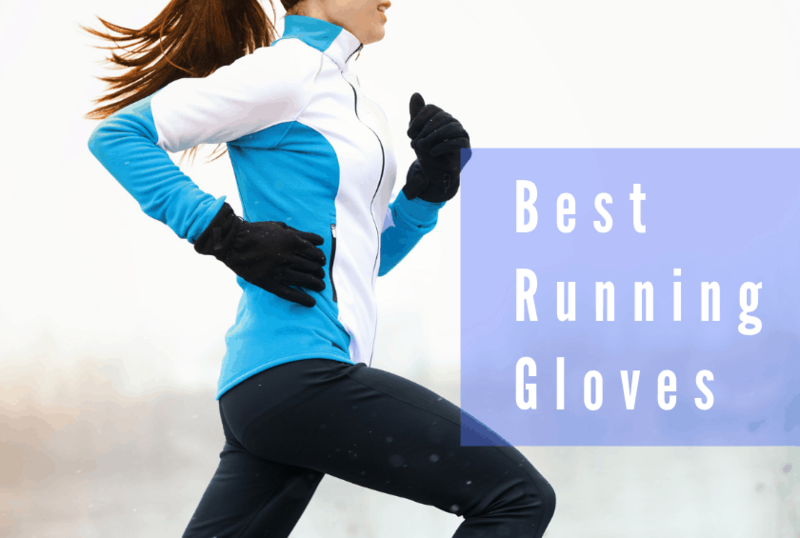 The best running gloves are technological marvels in comparison to other gloves you might use to keep warm. In this article, we’ll look at a handful — no pun intended — of the best running gloves on the market so that you can stay warm when the weather is chilly. Here are a few ideas about which runner’s gloves might work for you. The Lite-Show Glove is notable for its ability to keep you warm while also keeping you visible. As with many running gloves, Lite-Show gloves have a reflective patch that will alert passing vehicles to your presence. As a result, you can run in safety, even at night. The Lite-Show is made out of polyester and rayon, both wicking materials. Wicking in gloves is important because accumulating moisture on or near your skin will chill you. These will also keep your hands warm, protect your skin from UV rays, and block a small amount of wind. That being said, the main drawback of this glove is that its wind protection isn’t that powerful. Furthermore, they aren’t water-resistant, so they won’t protect your hands from getting wet if there is heavy rain. You may need to tuck your hands inside your windbreaker for adverse weather conditions. The Smartwool Merino 150 wool glove is ready for serious runners to use in the fall or winter. Wool is warm even when it’s wet, which makes this glove perform great in the snow. You’ll still feel the wetness from snow that melts on the gloves, but your hands won’t get cold as a result. In the rain, these gloves aren’t as strong. The coldness of the rain will end up piercing the glove, as will the wind. High wind-chill factors may leave you feeling cold. On the other hand, these gloves are more or less perfect as far as good-weather running is concerned. The only point of improvement would be to add a reflective surface to make the runner more visible at night. These New Balance Lightweight Running Gloves are a great set of all-around running gloves. They’re easy to fit, stretchable, easy to wash, and stay odor-free with heavy usage. As a nice touch, these gloves have gripping traction on the palms, so you can handle things like your water bottle without worrying about fumbling it while running. 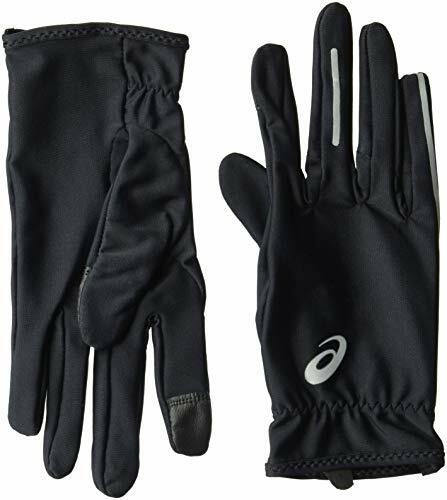 The gloves have a few reflective surfaces for safety during night runs, touchscreen compatible fingertips, and a thin layer of material to keep your fingers warm during cool days. While these gloves aren’t very warm, they do offer a measure of protection against the wind. Furthermore, they resist water until they become fully soaked. This means that they are suitable for jogs during light rain. Heavier rains or winds will leave you feeling colder than if you weren’t wearing the gloves, however. The Zensah Smart Running Gloves are a substantially warm pair of gloves, thanks to their polyamide and elastane construction. The Zensah gloves combine high breathability with warmth, reflective stripes, and a few oddball features. Among these oddball features is the suede swatch on the thumb of each glove, allegedly to wipe your nose. While it might be odd for a running glove to include such a feature, most runners struggle with runny noses at some point or another–and even more so in the cold. The gloves also have a good gripping swatch on the palm and touchscreen-compatible points on the fingertips. Overall, the Zensah gloves are a little bit bulky, a trade-off for their added warmth. Furthermore, while somewhat windproof, they aren’t entirely waterproof. The Saucony Ultimate Touch Tech Gloves are lightweight, reflective, and touchscreen-friendly. They’re also made out of polyester and spandex, making for an easy fit, streamlined appearance, and mild water resistance. 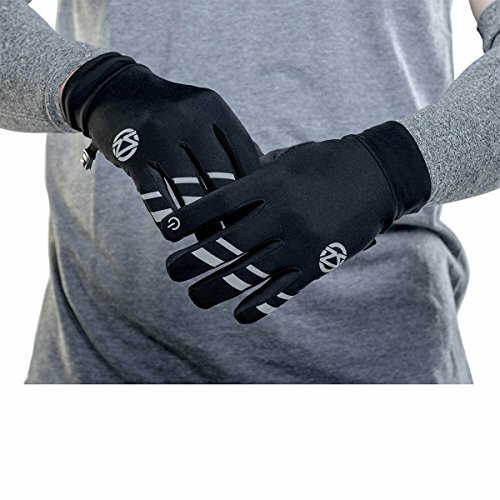 These gloves have an extended cuff, which is great for covering any running tech that you wear on your wrist. On the other hand, the cuff isn’t as roomy as the rest of the glove, which means that you might struggle to fit your device. The Touch Tech Glove also has fleece nose wipes on each thumb, which is a nice feature. The fleece nose-wipe point holds moisture effectively, and it won’t hurt your cold nose as a suede wipe area might. 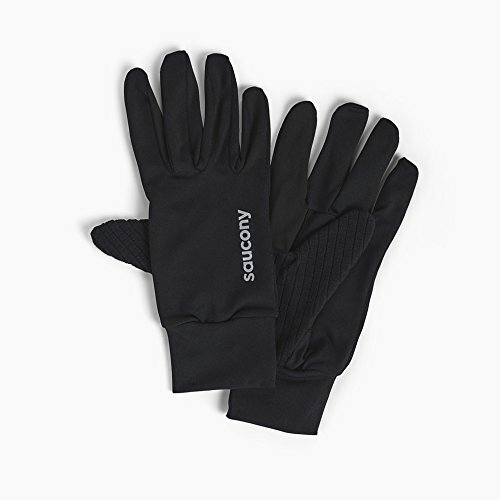 For cold but wind-free days, these Saucony gloves are more than warm enough. On the coldest days or windy days, however, you will want for more insulation. This is especially true if you have a watch or Fitbit on your wrist, which will make the gloves cooler. 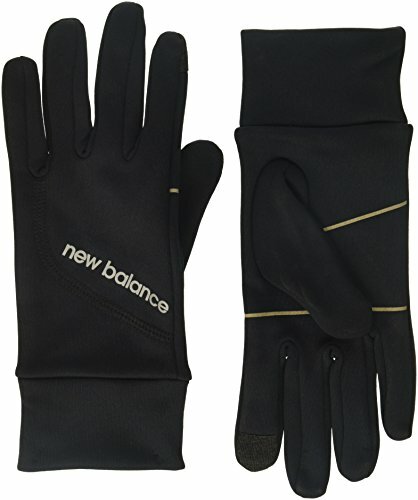 The New Balance Unisex Running Gloves are standard running gloves which work somewhat well in most running conditions. With these gloves, you’ll get a decently-fitted but basic garment that is touchscreen-compatible and moisture-wicking. The problem is that the way these gloves are designed, these two features clash. Moisture can be wicked from your finger directly onto your touchscreen. These gloves are fairly bulky, considering that they aren’t very warm. The appeal of the bulk is that it provides a measure of wind resistance rain resistance. Unfortunately, the polyester materials make the gloves much colder once they are soaked in rain or sweat. 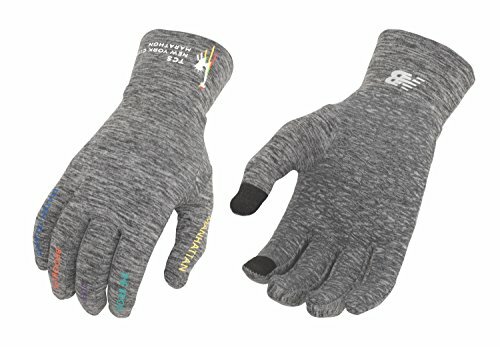 For marathons, these gloves are probably not the right choice. The TrailHeads Running Gloves are ultra-lightweight and tightly fitted gloves which are perfect for serious runners looking for something to protect them during the long hauls. With several visibility swatches, these gloves help you stand out even in a blizzard. Furthermore, the tightness and lightness of the gloves mean that they will help you maintain efficiency, even when you are running a marathon. The mesh inserts on the gloves are another great feature, because they allow your hand to vent directly to the outside once it has warmed up. At the start of your run, you may be a little chilly, but by the end of the run, you will be grateful for the mesh. The tight fit of these gloves helps to wick moisture more effectively. These gloves are also rain-resistant, though not wind-resistant. The Adidas AWP Shelter Gloves are intended to keep you warm on extremely cold days. And, they also look great. 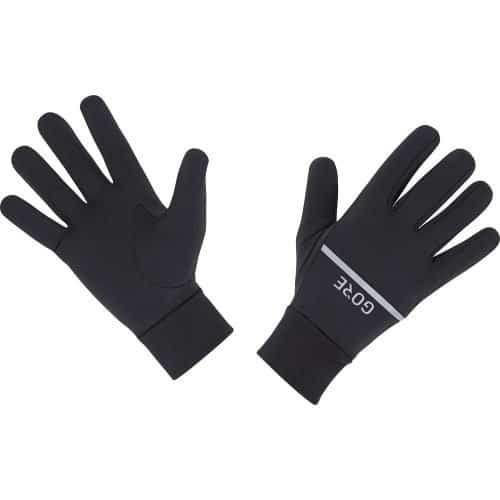 The polyester material is built with double-bulk, meaning that you will have a lot of warmth when you wear these gloves. While they are not wind- or water-resistant, you will find that the bulk keeps the wind at bay. These gloves lack visibility features, but they do have an aesthetically appealing digicam design. 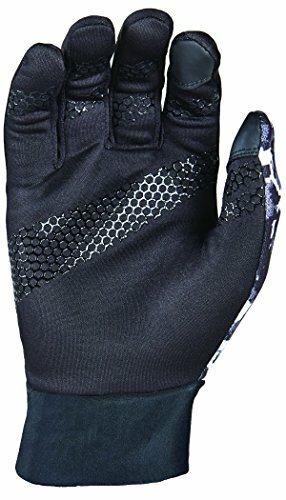 These gloves are semi-breathable, which may make them a bit sweaty on the inside on the longest runs. Shorter runs shouldn’t cause any problems. The upside of the bulk is that the touchscreen-capable fingertips won’t ever leak moisture. 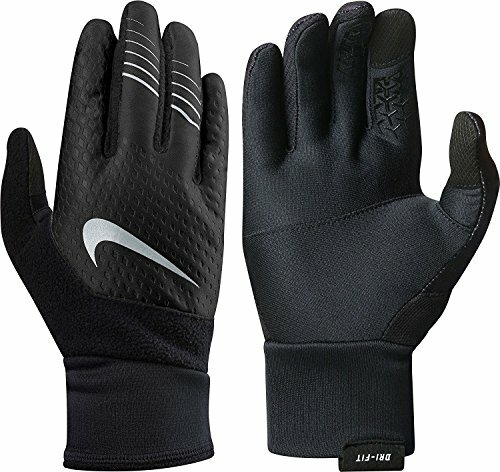 The Therma-FIT Elite Gloves by Nike are intended for keeping you warm during the coldest and nastiest weather. 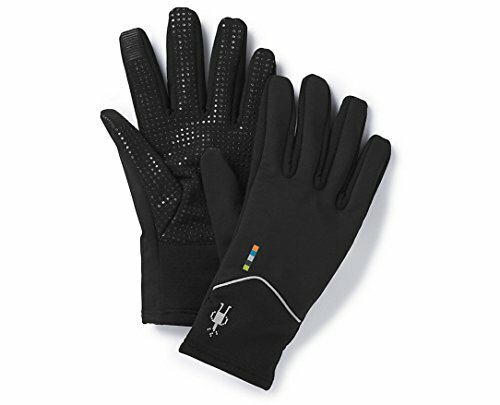 Because they have Therma-FIT fabric, these gloves stay warm when they’re wet. They will also wick moisture away from you, saturating the fabric in the process. On your most vulnerable fingers, these gloves have waterproofing and windproofing. The nose-rub swatch is also the point of highest moisture wicking, which may become a bit disgusting after a long run. Luckily, these gloves are very easy to clean. This means that you won’t need to worry about how much you may sweat while running on a freezing cold day. The gloves also have fairly good palm traction and effective extended-length cuffs. The Smartwool PhD Wind Training gloves, made from a nylon, merino wool, and elastane blend, bring all of the core features of a running glove together in one model. 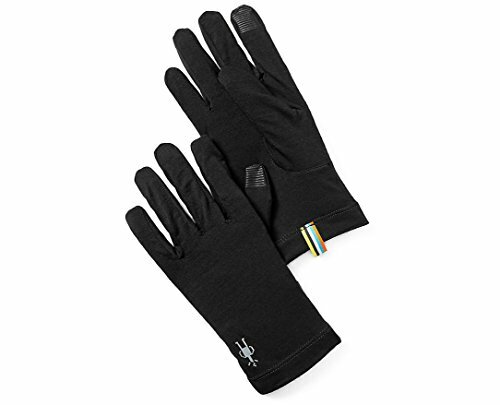 With windproof front and moisture-wicking back, these gloves keep the cold away from where it’s most likely to be. The gloves are not very warm in absolute terms, but they tend to maintain their heat even in the face of bad weather conditions. This makes them relatively warmer than other gloves would be. The Smartwool PhD gloves aren’t the lightest, but they’re far from bulky. The important thing to remember is that these gloves aren’t intended for the warmer end of the cold-weather specturm. Furthermore, thanks to their touchscreen-capable fingertips, you won’t need to worry about missing out on any updates while you run. 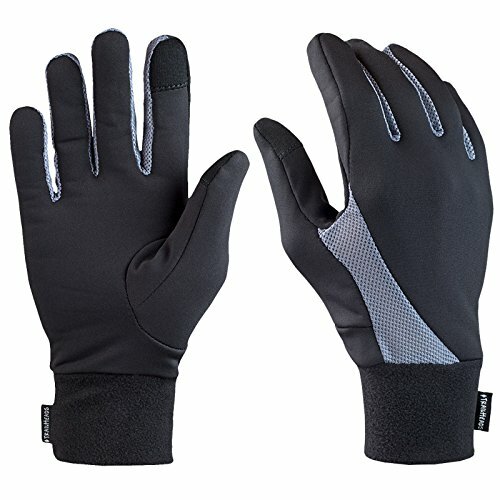 This lightweight pair of running gloves is a great option for cool days. The stretchy, moisture-wicking fabric combined with reflective detailing make them a nice option for early-morning or late-evening runs. The Gore R3 gloves have a stretchy fit that’s true to size. They are somewhat thin, but heavy enough to keep your hands warm on days when the temperature sits between 40-60 degrees. Unlike some of the other gloves we’ve reviewed, these have a long cuff that covers your wrist and part of your arms. This ensures there’s no gap between the gloves and your sleeves – a problem we’ve seen with other running gloves. The reflective detail is good for low light conditions. We always recommend a reflective vest and/or a headlamp, but you can never have enough reflective material when running in the dark. The R3 gloves are also priced right. At $30, they are a good value. The gloves don’t have added material on the fingertips for touchscreen on a phone. But we’re ok with that, knowing that this feature typically doesn’t work too well on gloves that do have it. Since you’ll be using these on cool but not cold days, it’s not a big deal to take the gloves off if you need to use your phone. Despite being made by Gore Wear, a company known for incorporating water-proof gore-tex into their products, these gloves are not waterproof. They do wick moisture, so the should dry fairly quickly if they get wet.